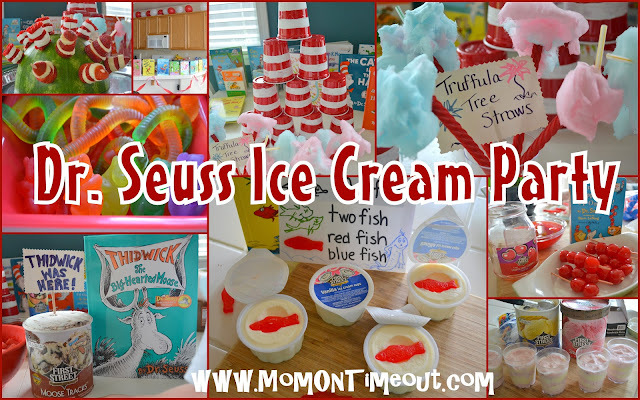 Dr. Seuss Ice Cream Party! We had considered Wacky Wednesday for the party but settled for plain old Thursday instead. A couple of days before the party I headed over to Smart & Final to do some shopping. I took the boys so they could help me pick out which flavors of First Street Ice Cream to have at the party. There was a nice selection and we ended up with Vanilla, Strawberry, Rocky Road, Mint Chocolate Chip and Moose Tracks. We also picked up some Vanilla Ice Cream Cups – you know the ones with the little wooden spoons? So perfect for the kiddos! The ice cream was a great price too! Reece thought it would be a great idea to pick up one of these giant tubs of ice cream but I was able to talk him down to the standard half gallon size 😉 The ice cream was delicious and received rave reviews! My favorite was the Moose Tracks – soooo good! You can check out my entire, fun-filled shopping trip at Smart & Final here on Google+. We picked up some red and white balloons and streamers to decorate the house. I had totally forgotten how tired your cheeks get when blowing up 50 balloons!! Reece really wanted to help with that but…well, let’s just say I didn’t want “wet” balloons 🙂 I put the balloons on top of the kitchen cabinets and all around the house. The red and white streamers really made this ice cream party a true party! I placed Dr. Seuss books all around the kitchen counters and on the table too. Yes, we do own this many Dr. Seuss books 🙂 More, actually. We ended up with quite a haul that turned out to be perfect! I started prepping for the party a couple of days in advance. I blew up all the balloons and started on the first Dr. Seuss element which was the Cat In The Hat hats made out of red plastic cups. I painted on two white stripes using acrylic paints. It took a couple of coats but they turned out so cute! I had so many people say how creative those cups were and they were so easy to make. I love serving ice cream in cups for kids. It’s a lot easier and less messy! The day of the party everything came together beautifully! I started with this gorgeous watermelon that I picked up at Smart & Final. I cut it in half and scooped out the insides creating a hollow shell. I placed it on a serving tray and got busy creating some hats. I made Cat In The Hathats using red vines and marshmallows. I simply cut the ends off of a large marshmallow and then cut it in half. I also cut Red Vines into small pieces. 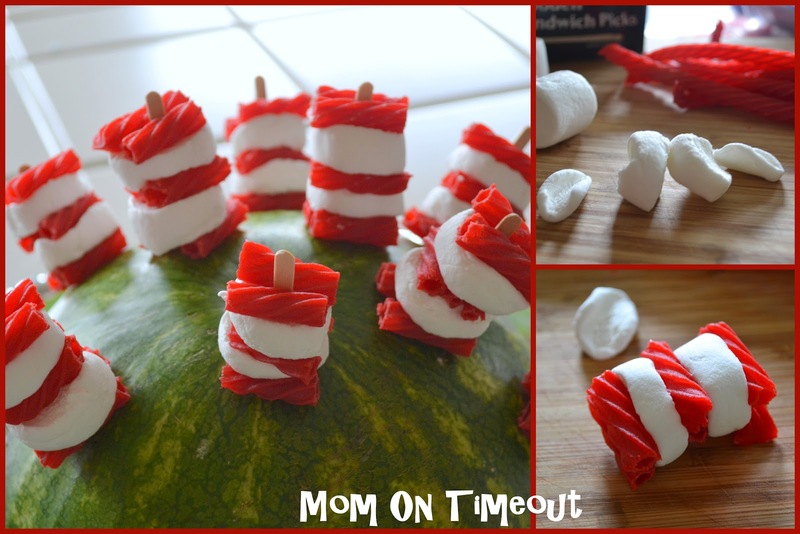 Layer the marshmallows and Red Vines to create a Cat In The Hat hat. I used wooden sandwich picks to hold it all together (although the sticky marshmallow does a pretty good job by itself). Stick the picks into the watermelon leaving a small section exposed so little hands can grab them easily. (Note: When you put the picks in, pull them out once and then put them in again. This loosens them so people don’t have to tug so hard to remove the hats.) So cute – SOOOO yummy! One more Cat In The Hat hat – this is the last one I promise! I couldn’t resist because it was so easy! I used clear plastic tumblers that I picked up at Smart & Final and layered strawberry and vanilla ice creams. That’s it! These were a definite crowd pleaser. Easy for the kids to just pick up, grab a spoon, and go play in the yard. Next up: Truffula Tree Straws! I just had to make some Truffula Trees for this Dr. Seuss party! 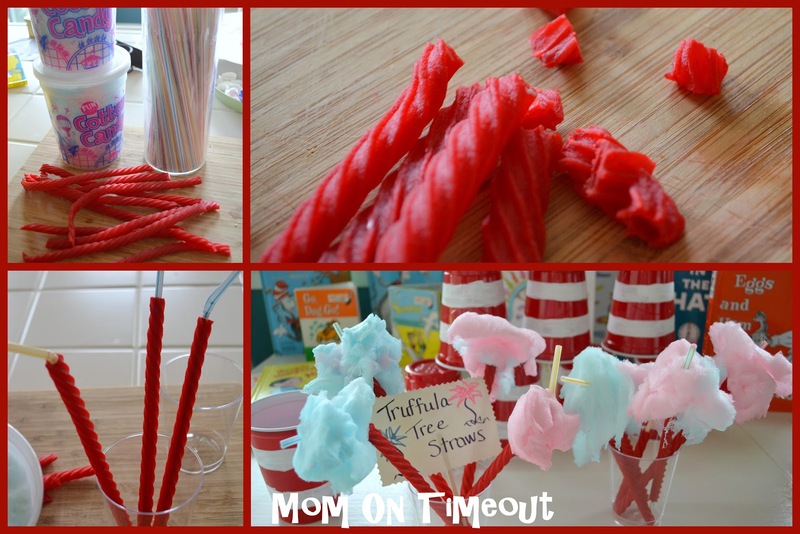 I used cotton candy, red vines, and straws. These were perfect for our Root Beer Floats and would be great with milkshakes as well! Simply trim the ends off of the Red Vines so that there is an opening for the straw to slide through. You can cut the straw if you’d like to vary the height of your trees. Use the cotton candy to create the Truffula trees – the more the better! I set out some Root Beer and First Street Vanilla Ice Cream for easy-to-assemble Root Beer floats. And here they are in all their fluffy, Truffula Tree glory! Any excuse for cotton candy am I right??? 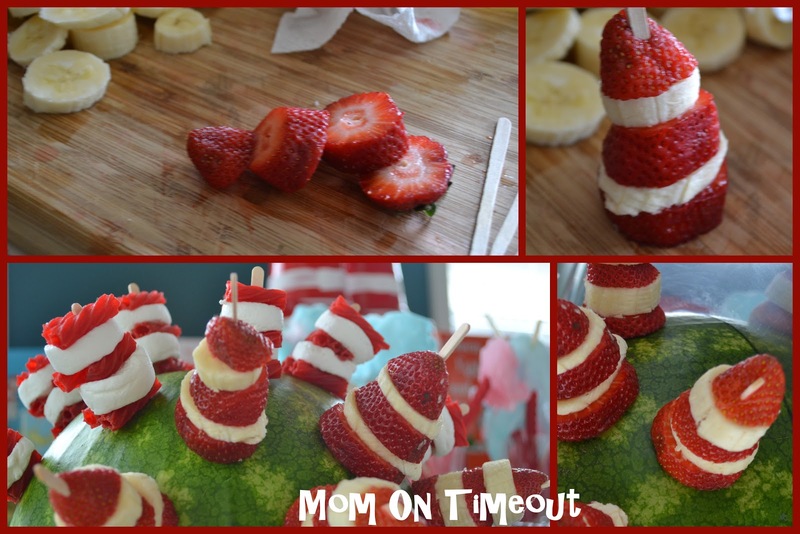 I explained this to the kids and they were very impressed, as only kids can be 🙂 In addition to the Cat In The Hat cups, I also had some First Street Ice Cream Cup Cones out. I got the colored cones because let’s face it, color is more fun 🙂 There was First Street Chocolate and Strawberry syrups as well as caramel and strawberry sauces and First Street Light Whipped Cream to top off the delicious ice cream with. In a separate tray I had sliced strawberries and bananas so there were some healthy and yummy options available. I have to ask – did you see this one coming? Moose Tracks? Thidwick The Big-Hearted Moose??? Oh yes! THIDWICK WAS HERE! Got one more for you! One fish two fish red fishblue fish. Wondering what I did with my little First Street vanilla ice cream cups?? Swedish Fish became the “red fish” and were a fun little surprise when the kids opened up the cups. Think of your guests. I chose to have everything set up on our kitchen table making the ice cream and toppings easily accessible for the kids. Have a number of scoops available and a cup of warm water to rinse the scoops. Offer a variety of toppings: fresh fruit, candies, syrups, maraschino cherries, etc. Use cups if kids are coming – it’s easier for them to hold onto and are portable. Offer some options other than ice cream such as floats or milkshakes. Go overboard! It’s an ice cream party – have fun! If you haven’t tried Smart & Final’s First Street Ice Cream – you’ll want to make a beeline over there right now! Really top-notch ice cream – super creamy and so delicious! You can visit Smart & Final on their website or follow along on Twitter or Facebook. I’d love to know if you host ice cream parties during the summer and what you do to make it special. I’m looking forward to another ice cream party soon! If you didn’t get enough here, make sure to check out my Google+ Album for more party pics! Linking up here, Home Stories A2Z, Savvy Southern Style, Serenity Now, and My Repurposed Life. « Fun Activities for the Family! Such cute ideas in your party.I am pinning to my kids party board. Visiting from SF. Drop by sometime if you like. Hooper Humperdink is my favorite Dr. Suess book! The party looked awesome! Hi, great post. I found you through the blog hop. Please stop by and say hi when you get a chance. .Be sure and check out my new Blog Hop that started. It’s Weekly Goals Link Up. It’s a great way to stay on track. Have a great day. 🙂 Now following you. Here’s the link for it if you would like to check it out. You did a great job, Trish! Everything looks fantastic. I love Dr Seuss! This is a fantastic idea. So cute!! !